"The burial of the late Mr. George Macpherson, of Carnamah, (Midland Railway), took place on Monday afternoon last, in the Anglican portion of the Culham Cemetery. The deceased, who came to his death as the result of a gun accident which happened on Friday morning last at Carnamah, while out shooting with his brother, Mr. Donald Macpherson, was widely respected in the district, and general regret was expressed at his untoward end. He was the youngest son of the late Mr. Duncan Macpherson, and was 41 years of age at the time of his death. The remains of the deceased were enclosed in a polished jarrah casket, mounted with silver-plated handles, and were conveyed from Perth and Newcastle by train, and thence per road to the Culham Cemetery, where the remains were laid in the family grave. The chief mourners were: Messrs. John and Donald Macpherson, brothers; Messrs. Duncan and Donald Macpherson, Donald J. Chipper, and A. Stevens, cousins. The pall-bearers were: Messrs. S. F. Moore, M.L.A., Samuel J. Phillips, J. H. Phillips, A. E. Viveash, N. Bostock, and G. Viveash. The funeral service at the grave was read by the Rev. J. Ellis. The funeral arrangements were carried out by Mr. J. Worth, of Newcastle." "Macpherson - At Perth, W.A., on December 25, 1904, suddenly through the result of an accident, George, the youngest son of the late Duncan Macpherson, of Carnamah, Midland Railway, W.A., aged 41 years. Deeply regretted by his loving sisters and brothers." 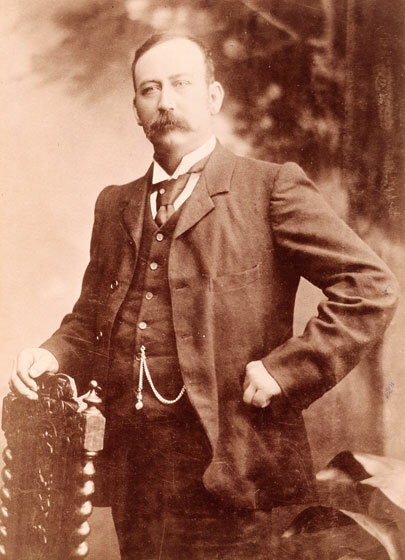 "A fatal gun accident occurred on Friday, December 23rd, resulting in the death of Mr. George McPherson (of McPherson Bros., of Carnamah), on the Midland railway. It appears that Mr. McPherson, with his brother, Donald, went out shooting, about 20 miles from home. When half the homewards journey had been accomplished, Donald alighted from the buggy to give a black tracker some rations, leaving his brother holding the reins, with a double-barrelled gun between his knees. As he turned to get in again, he heard two reports, and saw his brother lying on the ground. The reins had become entangled with the triggers, and the charge in both barrels had exploded, entering Mr. McPherson's right arm near the shoulder. Mr. Donald McPherson placed his brother in the trap, drove him to the station, and they boarded the train for Perth. Dr. Kelsall joined the train at one of the stations en route, and did all that was possible for the sufferer. On arrival he was taken to Miss McKimmie's hospital, and attended by Dr. Kelsall. The next day an operation was considered advisable, and in the afternoon Dr. Kelsall amputated the injured limb at the shoulder. The patient appeared fairly well after the operation, but at 2:30 p.m. on the following Sunday morning he died, as stated, from shock. The body was conveyed to Newcastle by the 5 o'clock train from Perth on the Monday morning. The remains of the deceased were deposited in the family grave at Culham in the presence of a large gathering of sorrowing friends. The funeral service was read by the Rev. J. Ellis. The deceased, who was a single man 41 years of age, was a popular member of a large and well known family, and great regret and sympathy has been occasioned by his untimely death."